Shyloh Belnap: Coming up on Good Things Utah...and a GIVE AWAY! Coming up on Good Things Utah...and a GIVE AWAY! I will be on Good Things Utah Today!!! I am going to be making these darling wood blocks! If you would like to purchase the wood to buy them, check out our website at http://www.apage4allseasons.com/ and you can look under GOOD THINGS UTAH CRAFTS. Check back later, we will be adding pictures of the brown blocks we did on the show as well! If you like this project, comment on this blog and you will be entered (using random.org) for a chance to win a set of blocks for yourself! For a second entry, comment on here your opinion of having one BIG prize per month or weekly drawings for smaller items... We will have our drawing on Friday! Also, we will be holding our drawing for the Stampmaker tomorrow night, we are still running a report on all orders placed. 1. Paint all the wood. 2. Lightly sand the wood in order to get it to feel more smooth. If you like the color to be more solid, you can do another coat of paint. I just do the one coat and the mod podge helps (later) makes it look “new” again. 3. Cut your pictures to be 2.5 x 2.5. Mod Podge to the top of the blocks. 4. Sand the edges of your paper. If you like a more “clean” look, you can use an exacto knife. 5. Do a coat of mod podge on the entire block. 7. Tie all the blocks together with your favorite ribbon! You can use pictures of your children, grand children, pets or… you can do pictures of you doing your favorite hobbies! The ideas are limitless! Those blocks are adorable! I would definitely like to have those in my home. I would prefer to have 1 big prize a month. I love the blocks of pics. I have two girls and one dog so I'd put their pictures on the blocks. I like the weekly drawings too. So darling, I would love a set for my three little gals! Hope I win! 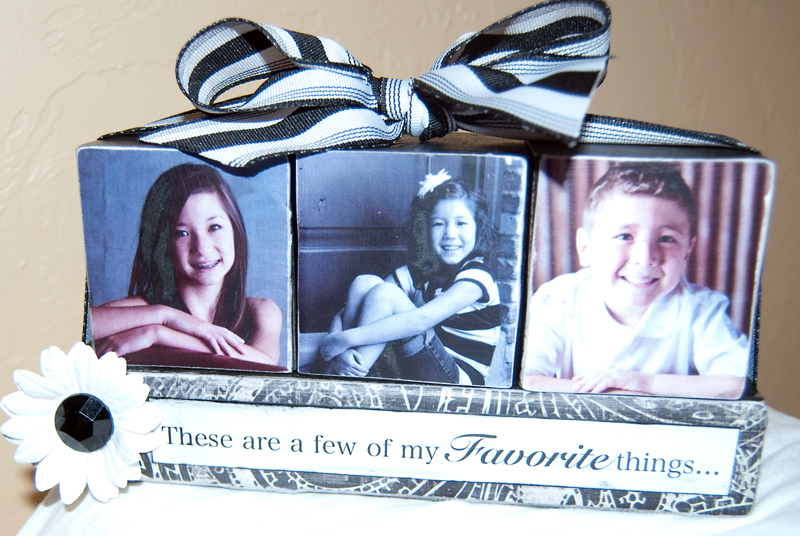 I love these blocks and I'm going to make it for the Gma's! Thanks so much for the idea! I would like to win anything!!! LOVE the blocks! Will probably be ordering some blocks for a craft night in February! I think it is fun to have weekly prizes, give more people fun prizes! I like the weekly drawing idea too! So adorable! I can't wait to get home tonight and watch GTU to see you on there! I think it would be cool to change it up! Maybe one month you do four little drawings and the next month you do one BIG prize! Sorry I don't like these blocks.... I LOVE them! So many great possibilities for these. Thanks for sharing the nice detailed instructions! I love these blocks. It is always hard to buy something for my parents because they have everything, but these would be perfect with grandkids pictures. I too like the weekly drawings. It gives more people an opportunity to win. I love the blocks and would like to have them sitting out in my home. I like the weekly prizes and agree that it gives more people a chance to win. What a great project! I need to print it so I can remember to make one for my mom next Christmas!! Thank you! What a cute craft! Such a great idea! This is the first time I've been to your site, so for prizes? I think I like the weekly ones. Great site! I love these blocks! They would be great to display pics of my 6 grandchildren. I like the idea of having the weekly drawing. I gives more people a chance to win. Thank you for such awesome auto-ship kits!